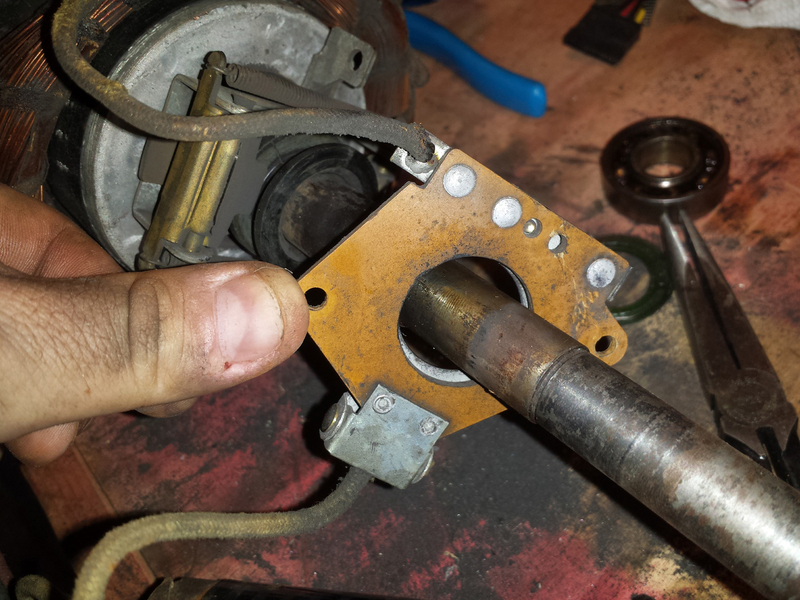 After removing the end frames, here is the right side of the stator with the rotor in place, and the rotary portion of the centrifugal switch visible. Thanks for your patience as I continue on this series. The ‘guts’ of a block grinder like this one consist of a stator, a rotor, a centrifugal switch, an electrolytic start capacitor, and a power switch. The power switch feeds power into the run windings and also through the start capacitor, centrifugal switch, and into the start windings. At rest, the centrifugal switch is closed, so giving the machine power will energize both the start and run windings. 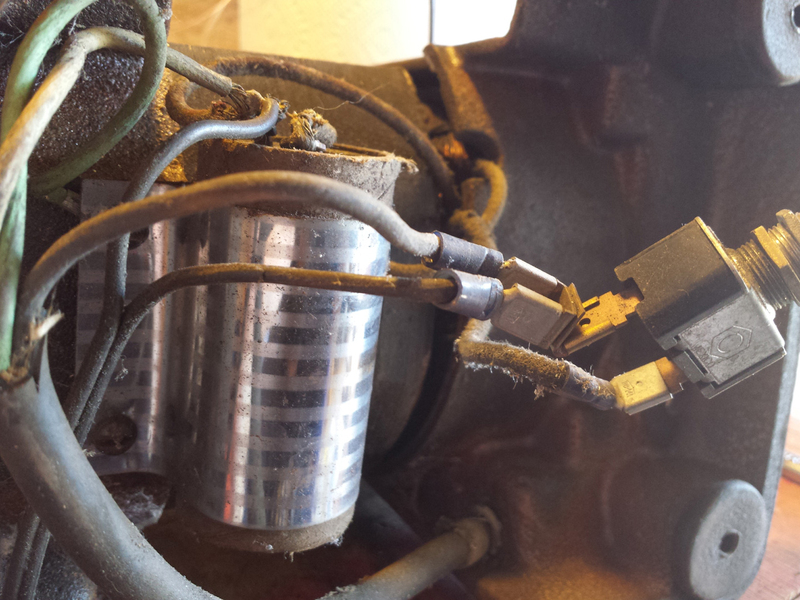 The capacitor phase shifts the amperage going into the start windings and makes the motor spin up. At about 75%-80% of full rated speed, the centrifugal switch opens, cutting power to the start windings and the start capacitor, leaving only the run windings engaged. 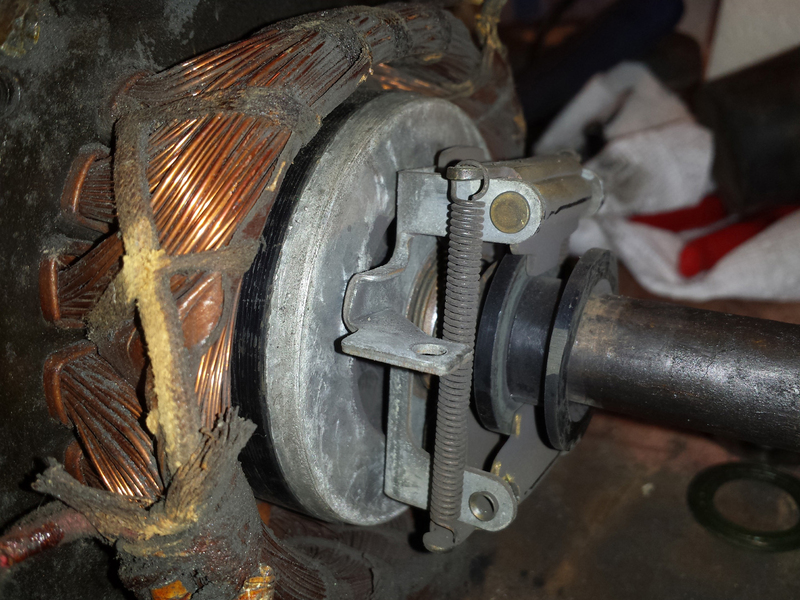 When the power switch is turned off, the motor slows, the centrifugal switch reconnects (usually with a distinct click), discharging the capacitor back into the start windings (causing some degree of braking), and the grinder coasts to a stop. 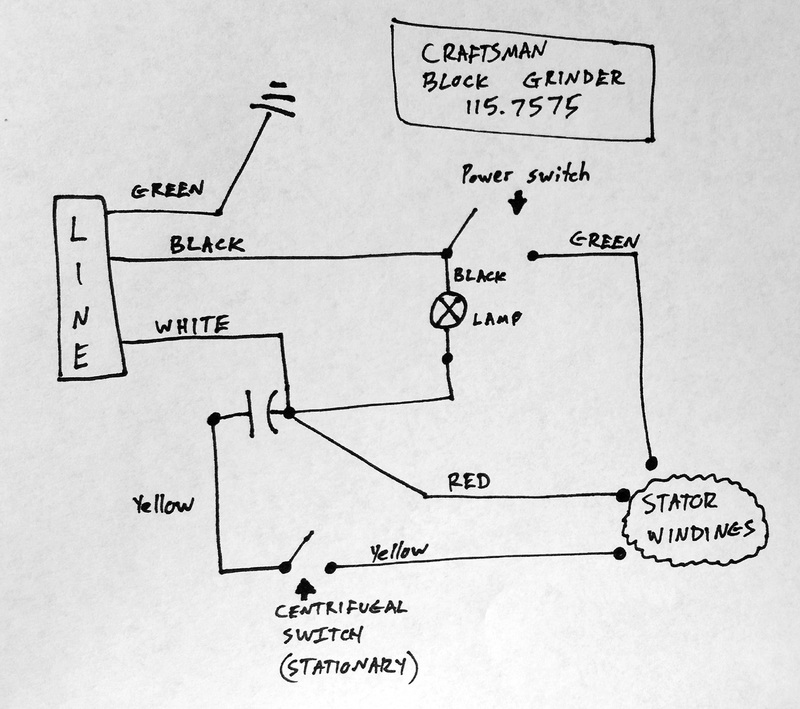 Here is a diagram of the wiring that I made from my notes. 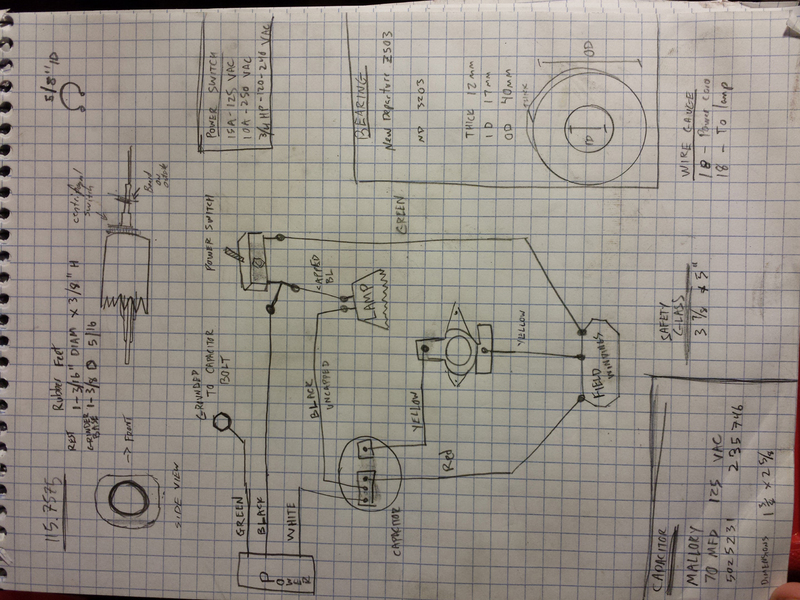 This is my original sketch with a variety of possibly useful notes. Remove the cord. I was going to replace it, so I ended up just cutting it. The center band is attached by four small screws. The power switch is held on by a little flat nut around the collar of the switch. My ON/OFF switch plate was missing. Center band is removed and the power switch is separated from the band. Underside of the grinder. The power switch is visible. The metal cylinder holds the electrolytic start capacitor. Make sure it’s discharged by bridging it with an insulated screwdriver. 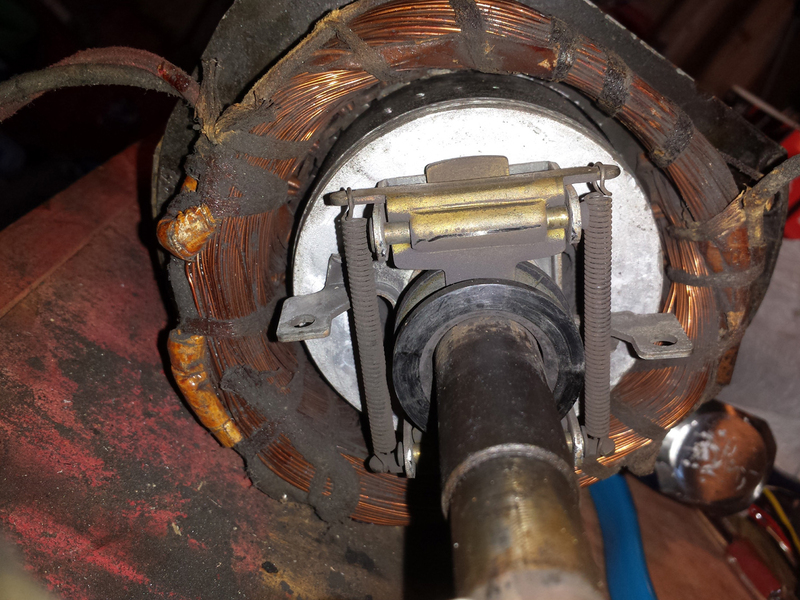 After removing the end frames, here is the right side of the stator with the rotor in place, and the rotary portion of the centrifugal switch visible. When the rotor spins, rotary forces cause the weighted ends to expand up and down (in this photo), pulling the plastic ring axially inward towards the stator. This removes pressure from the stationary switch, opening the circuit. The centrifugal switch has springs which keep a circuit closed when stationary. It opens at about 75% of full speed, disconnecting the start windings. 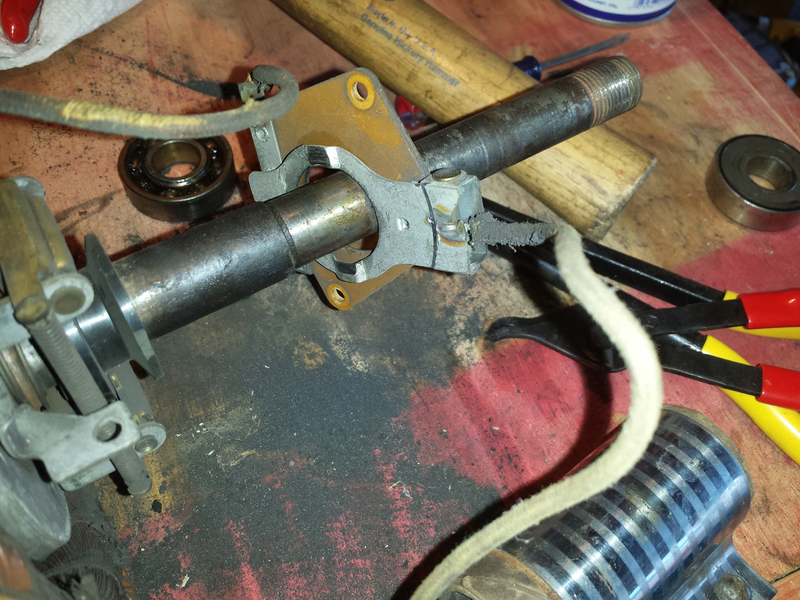 The centripetal switch stationary portion was screwed to the end frame with two screws. Here is one. 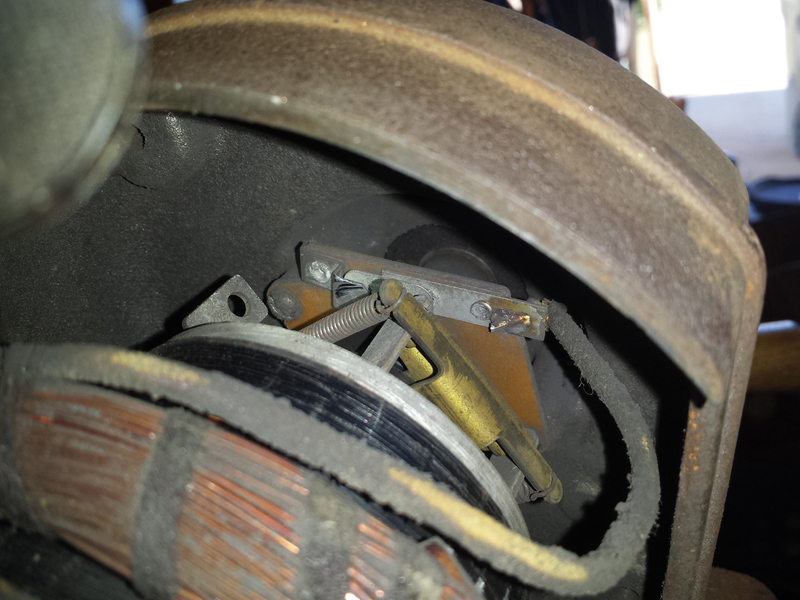 Here, the stationary part of the centrifugal switch is disconnected from the end frame. Pressure towards the tip of the rotor presses the switch closed; relieving the pressure (by spinning the rotor at about 75% of max speed) causes the switch to open, removing the start windings from the circuit. To remove the start capacitor, unscrew the retaining bracket. The capacitor itself was wrapped in cardboard. I removed the cardboard, allowing me to view the specs underneath. 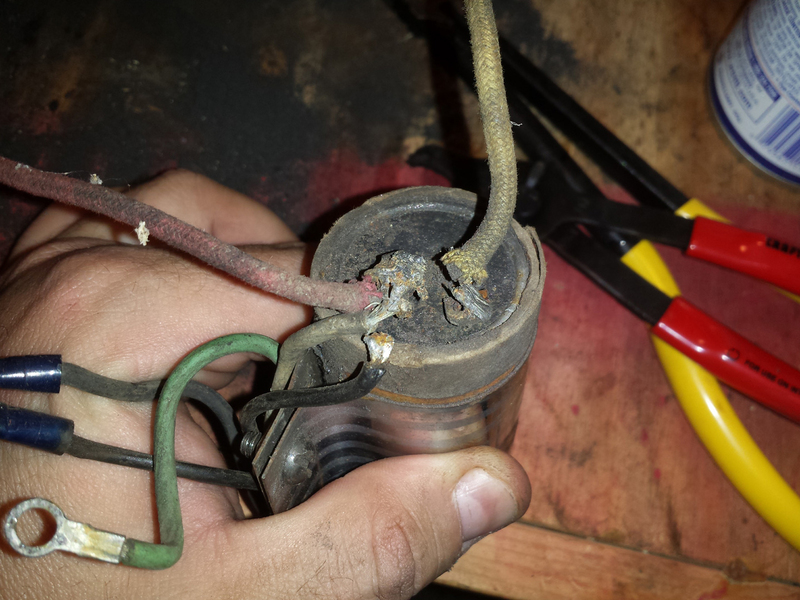 The capacitor was at the end of its useful life. 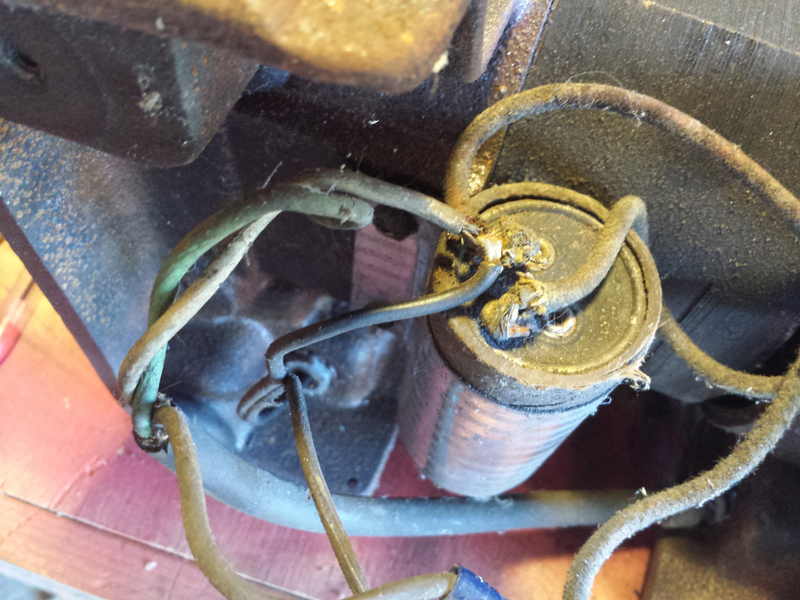 It was still starting the motor, but there was no reason not to replace it. The electrolytic capacitor was a MALLORY 70 mFD 125 VAC, with dimensions 1-3/8 x 2-5/8. The capacitor was pretty beat up. The wiring needs to be replaced or at least better insulated. Removing the cardboard around the capacitor revealed manufacturer’s markings which helps immensely with selecting a replacement. 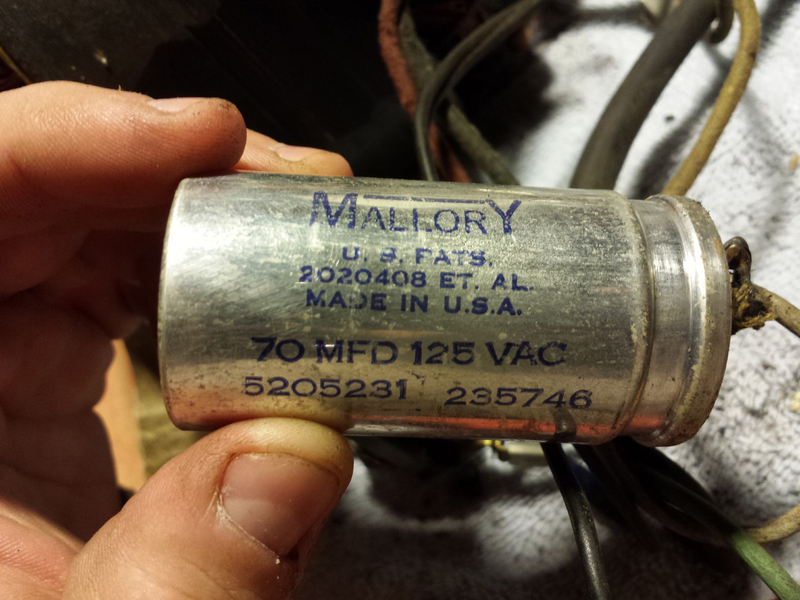 I ordered a Mallory branded (USA manufactured) 72-88 MFD 110-125V capacitor to replace this one (from ebay). I think that’s pretty cool, replacing it with an OEM capacitor. I think the total cost was under $10 shipped. You can go up a smidge (<10%) on the MFD rating, but you don’t want to go too high or low, or you can cause issues with spinning up the motor. 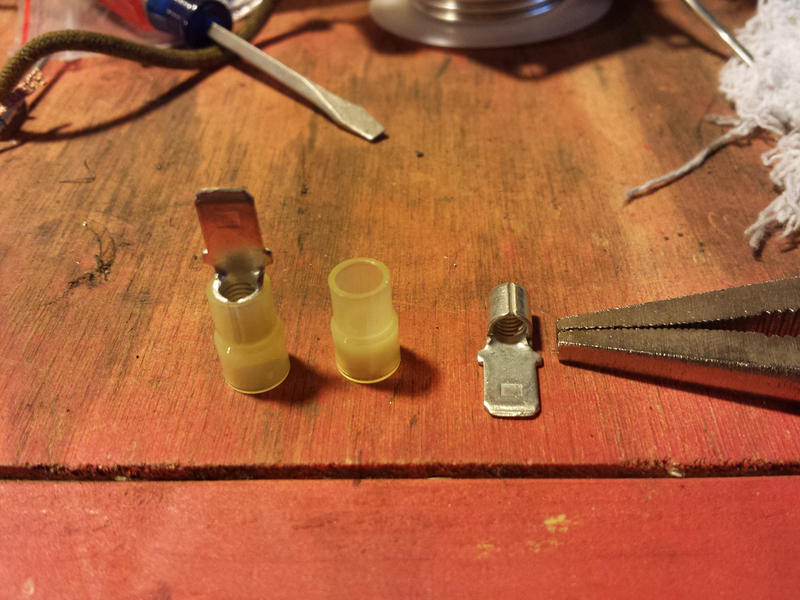 It’s better to find a replacement with nearly the same capacitance. Stick to the same VAC rating if possible, or you can go higher, but not lower. These capacitors are non-polar. I wanted to replace the wiring to the stationary centrifugal switch, but I didn’t want to re-solder it, so I modified the switch to incorporate 1/4″ quick connect leads. 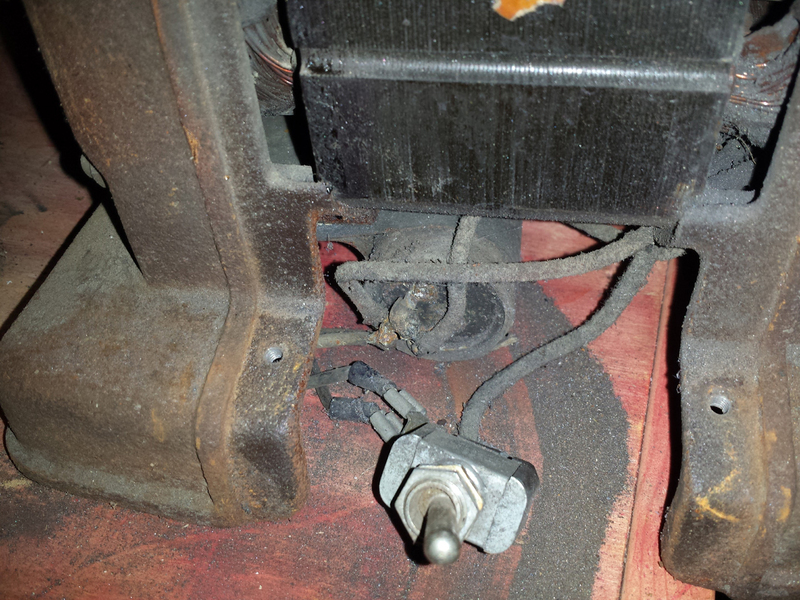 Here, the inboard side of the stationary centrifugal switch is disconnected from the end frame. 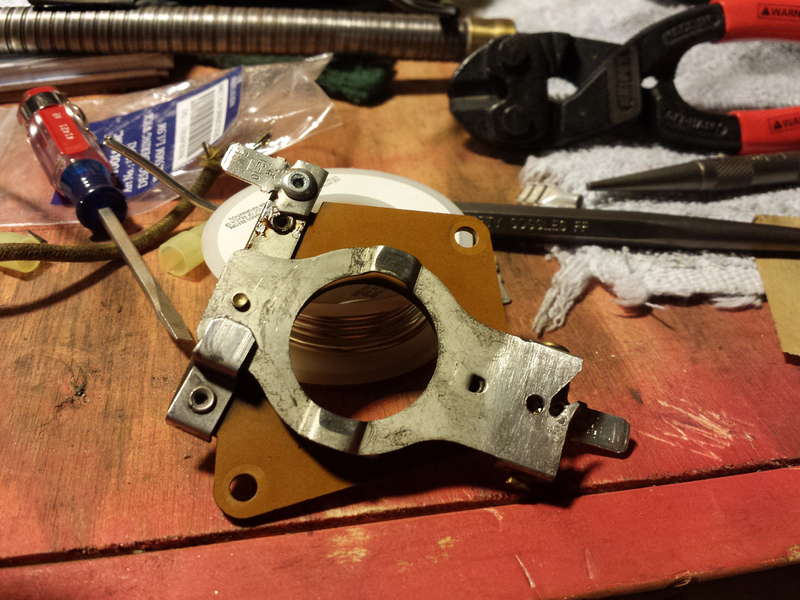 Outboard side of the stationary centripetal switch. The empty holes are where it screws onto the end frame. I removed a 1/4″ quick connect terminal from the insulation and clipped the ends so it was just a little bar. 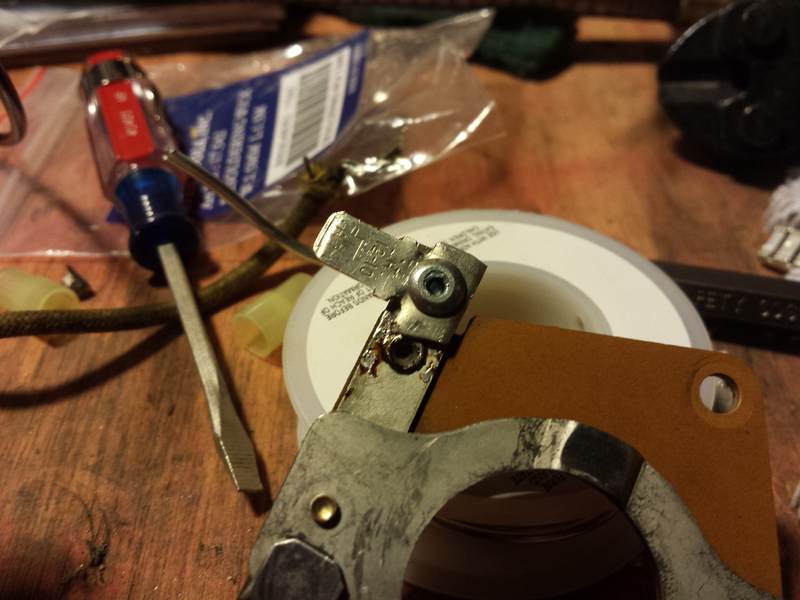 Then I drilled a 1/8″ hole to receive a pop rivet. Disassembling a 1/4″ quick connect terminal. I carefully drilled a 1/8″ hole in the switch over the contact area, being careful not to crack it with too much pressure. Then I used a pop rivet to connect the terminal end. I did the same thing on the other end. 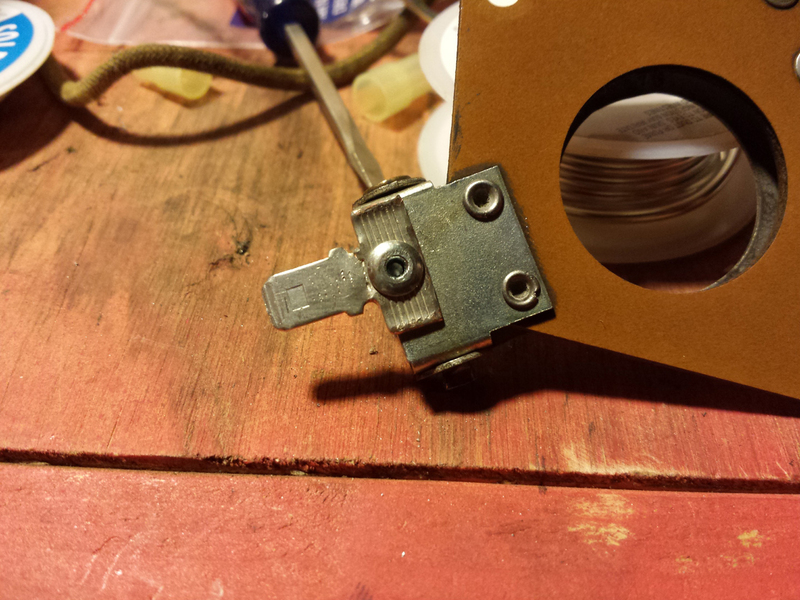 The modified stationary centrifugal switch, now featuring quick connect leads for easier wiring. I cleaned up the contacts with some fine sandpaper. Ok, now here, I’m embarrassed to say I neglected to take photos of the re-wiring. I originally did this project for a forum post, not a blog entry. I replaced the electrical cord with a new 14/3 wire cord. 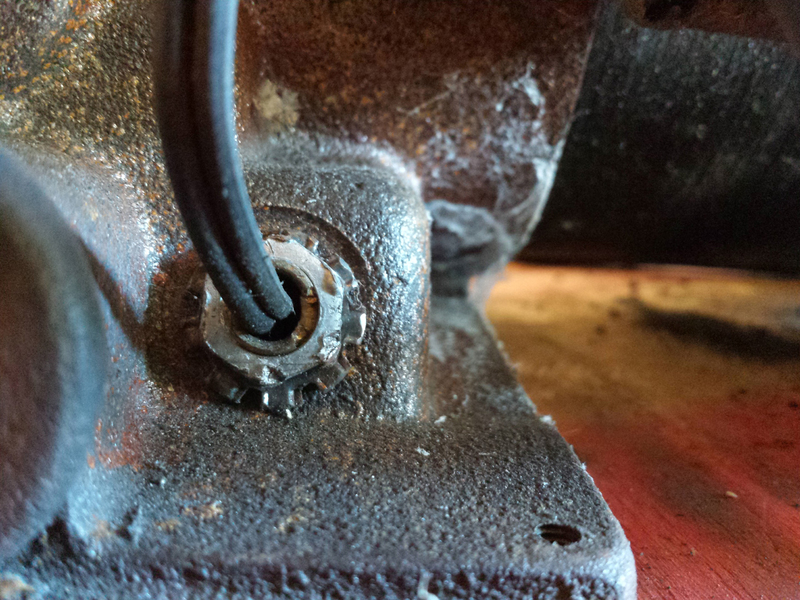 The green ground wire goes to a ring terminal sandwiched into a screw holding the capacitor bracket. For the other replacement wires, I used 14 gauge machine tool wire (MTW) from wirebarn.com (I had a good experience with them. They’re a small outfit in California, I believe). I replaced the black wires going to and from the lamp and the yellow wire going from the capacitor to the centrifugal switch. I clipped the three wires exiting the stator windings and shoved some heat shrink over them as far as I could get it, then crimped on quick connect terminals. I couldn’t access the interior of the windings to completely replace them, unfortunately, so I am hopeful the heat shrink will suffice. I lengthened them with MTW in the appropriate colors. 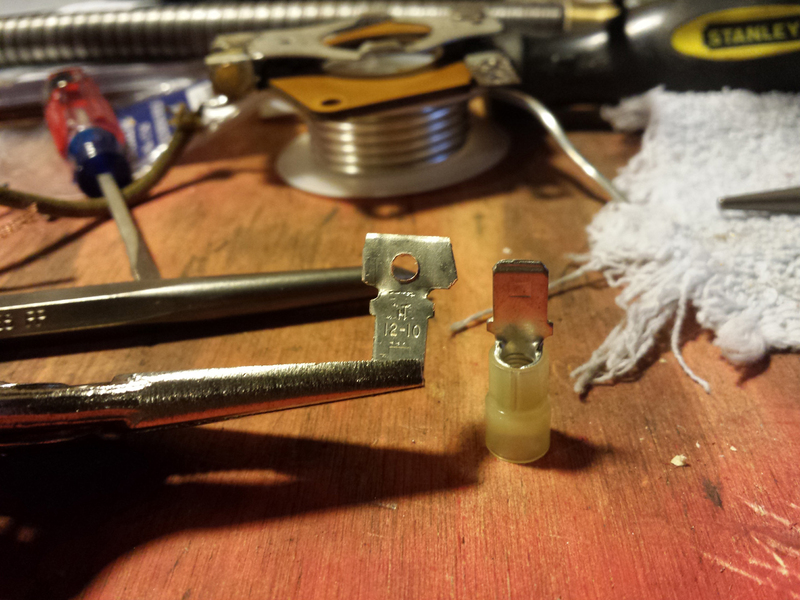 I added a strain reliever and gromet for the power cord where it entered the frame. I still haven’t found a replacement light fixture, so those two wires are currently taped up and not doing anything. The power switch, I believe I ended up replacing with a new single pole single throw switch, which was basically identical to the original. 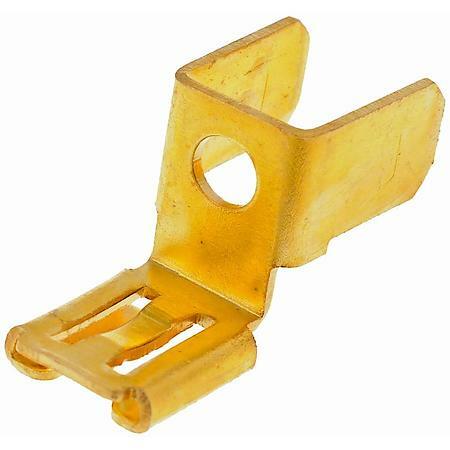 I needed a double pronged end for one terminal on the power switch, so I bought a double male 1/4″ copper quick connect chair adaptor like this one. You can find them anywhere – I think most car places have them, or you can look online. I think I used one for the capacitor as well, so that I could get three wires into one side. Double Male .250 In. tabs Interior Piggyback Disconnect Chair Adapter. 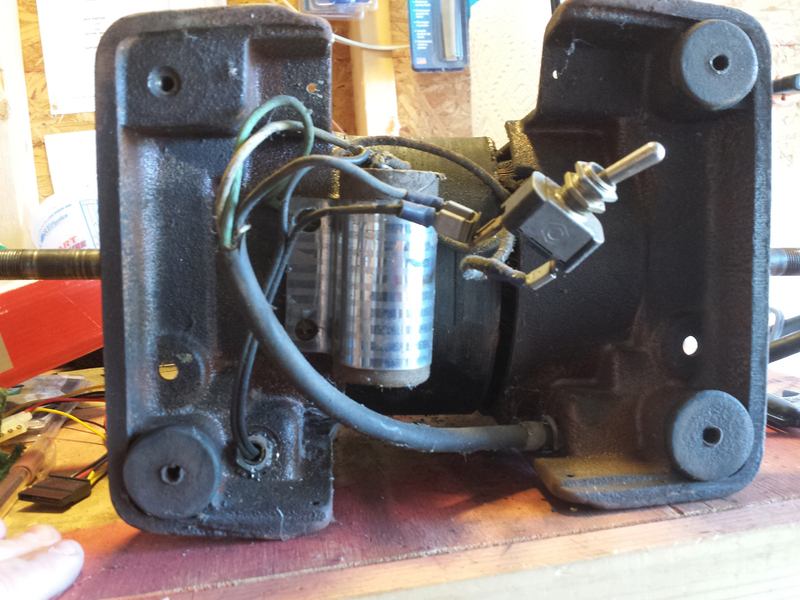 So, at this point, I had rewired as much as I could, I put in a new switch and start capacitor, I modified the centrifugal switch to be quick disconnect, and I was ready to reassemble the motor. So that will be the next post.